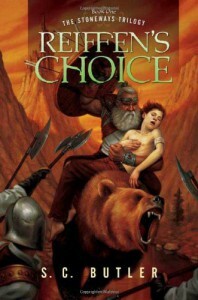 Reiffen's Choice by S.C. Butler is a story that reminded me most of a cross between Harry Potter and The Lord of the Rings. The former because the cast of characters includes a young girl and two young boys, and the latter because the world of Reiffen's Choice is very much traditional fantasy though with some flavoring of its own. The young adults in this tale are Reiffen, the exiled heir to the throne, Avender, a commoner who is also Reiffen's friend, and Ferris, the headstrong girl who rounds out our Harry Potter-like trio. This edition of the novel was published in 2007, so I don't think I'm being unfair in making this comparison. 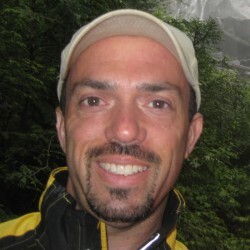 Butler distinguishes himself by adding in a Shaper by the name of Redburr, who most often appears as a bear but also as a bat, an eagle, and even a man. Presumably he can take any shape, though these are the ones he makes use of in this first novel of what is a three book series. Also, there is Nolo, a Dwarf who is a bit unlike the usual dwarves we are all familiar with. Dwarves in Butler's novel are limited in number; there are only eight hundred or so, and no women. Their skin is as hard (or harder) then rock and they are completely immune to the effects of magic. The villains in this tale are three wizards determined to use Reiffen to gain the throne that Reiffen himself will never possess. To this end, they kidnap the boy, setting off a chain of events that culminates in Avender, Ferris, Redburr, and Nolo setting off to rescue him. While Reiffen is tempted by the three wizards, those four make the arduous journey to the wizards' stronghold. Some of the story is taken up with this journey; it's easy to see why tales of this nature fell out of favor as once you've read enough of these sorts of stories, well, the traveling and discovering new places wears thin. Still, while there is definitely some text that could have been cut, it all flows along well enough. The novel is billed as "YA". While I would recommend it as such, I also didn't think it was only for young adult readers. It's a good story with some interesting characters and ideas. If you're looking for a three book series that has hints of the traditional fantasy many of us grew up with, I'd give Reiffen's Choice a look.